The avian Coronavirus infectious bronchitis virus (IBV) has a single-stranded, polyadenylated, positive-sense RNA genome some 27.6 Kb in length (Boursnell et al., 1987). IBV replication almost certainly proceeds by the same mechanism that occurs in the more intensively studied Coronavirus, mouse hepatitis virus (MHV). Genomic RNA is first translated to produce the viral RNA-dependent RNA polymerase, which transcribes the genomic RNA to generate a negative-stranded full-length copy of the virion RNA. This copy RNA then serves as a template for the production of a nested set of 3′ -coterminal transcripts from which virus polypeptides are translated (reviewed in Spaan et al., 1988). These transcripts include a genomic-sized RNA (mRNA 1) and five subgenomic RNAs (mRNAs 2–6) of which mRNA 6 is the smallest (Stern and Kennedy, 1980). Almost all detailed analysis of IBV gene function to date has concentrated on the products of mRNAs 2, 4 and 6 which encode the viral structural proteins spike, membrane and nucleocapsid respectively (see Figure 1). Together, these mRNAs account for less than 30% of the genomic coding capacity; most of the remaining information is in two large, overlapping open-reading frames (ORFs) la and lb, encoded by mRNA 1. These ORFs could potentially produce some 740 kD of protein and must encode the RNA polymerase (Boursnell et al., 1987). A number of associated activities predicted to be involved in viral replication are also suspected to be encoded by mRNA 1 (Gorbalenya et al., 1989). 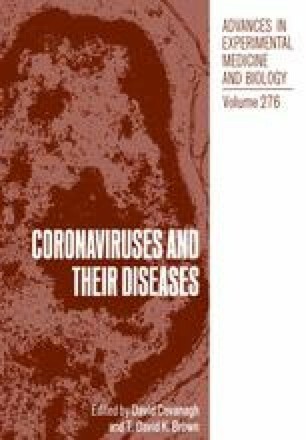 To date, however, the only product of this RNA that has been detected in coronavirus-infected cells is a 28 kD MHV polypeptide (p28) of unknown function (Denison and Perlman, 1987) which is derived from the 5′ -end of the MHV genome (Soe et al., 1987).